Name of Researcher / Enw’r ymchwylydd: Geoffrey Alexander Mitchell. Name of Memorial / Enw’r gofeb: Rhyl War Memorial. Regiment/Catrawd: 1st Battalion, Royal Welsh Fusiliers. Service Rank and Number / Rheng gwasanaeth a rhif: Private No. 53916. 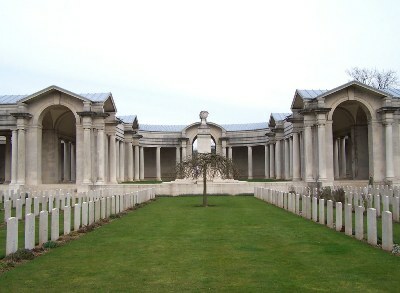 Military Cemetery/Memorial / Fynwent milwrol: Arras Memorial, Pas de Calais. Ref No Grave or Memorial / Rhif cyfeirnod bedd: Bay 6. Medals Awarded / Medalau a ddyfarnwyd: British War Medal, Victory Medal. Killed in action on Friday 4 May 1917. Robert was married to Matilda. Arras Memorial, Pas de Calais, France. On 20 August 1917, a payment of £6. 5s. 3d. was made by the War Office to Matilda Lloyd, being monies owed to her husband Robert. On 9 November 1919, a further payment which is recorded as a War Gratuity of £9. 0s. 0d was also made to her. Robert is also remembered on a Remembrance plaque at The Royal Alexandra Hospital, Marine Drive, Rhyl, Flintshire and on The North Wales Heroes Memorial Arch, Deiniol Road, Bangor, North Wales. There is no Flintshire Roll of Honour card for him at the County Archives Office, Hawarden, Flintshire.